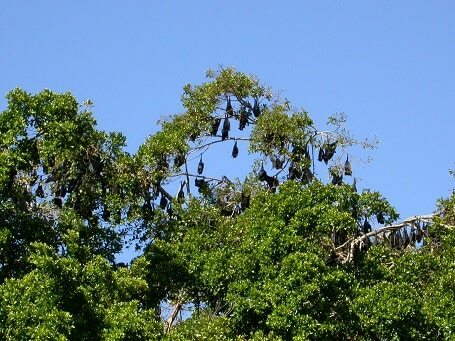 This Wednesday, Council will vote on the proposed relocation of the spectacled flying-fox colony near the Cairns City Library. Council voted in March to apply for a damage mitigation permit to relocate the colony, and are now considering how this may be done. There is significant local opposition to the proposed relocation for a number of reasons including excessive cost of the relocation, the low chance of success and the high risk of causing harm to this nationally listed protected species. In all cases, dispersed animals did not abandon the local area. In 16 of the 17 cases, dispersals did not reduce the number of flying foxes in a local area. Dispersed animals did not move far (in 69% of cases the animals only moved less than 600m from the original site). In 92% of cases, new camps were established nearby. In all cases, it was not possible to predict where replacement camps would form. Repeat dispersal actions were generally required (in all cases except where complete vegetation removal took place). The financial costs of all dispersal attempts were high, ranging from tens of thousands of dollars for vegetation removal to hundreds of thousands for active dispersals (e.g. using noise, smoke, etc. ).